We rely on volunteers to help out with duties that support the canal in meeting its objectives, so any activity you become involved in will help in many ways. You could potentially help run the Canal Visitor Centre and office; run boat operations or become a lengthsman to patrol a section of the canal, either as part of a work party, or if you have specialist skills such as engineering. Do you live near the canal and think you could help? Why not contact the Canal Centre for more details? The canal needs constant attention to keep it in a good state of repair for all who use and enjoy it, including the varied aquatic life it supports, and to reduce leakage for our neighbours. Heavy engineering works on the canal are mostly done in winter so as not to damage the aquatic plants which have special protection, and to limit interference with boat traffic; where draining is required it has to be planned carefully with the fish being moved to other lengths of the canal, and then refilled in the right order so as not to waste water. The latest updates on our current works can be found on the Basingstoke Canal Authority's website. The Basingstoke Canal Authority and the 50+ volunteer lengthsmen who help patrol the towpath, support the 'Share the Space, Drop your Pace' campaign to promote courtesy and better sharing of the towpath space by anglers, cyclists and walkers. This is particularly relevant through Woking town centre section, which sees heavy shared use of the towpath. The campaign is part of a national campaign for towpath courtesy run by the Canal & River Trust. 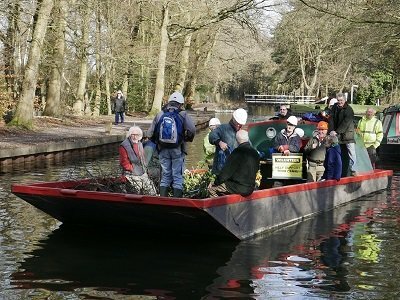 The 32 mile Basingstoke Canal, owned jointly by Surrey and Hampshire County Councils, is managed for the councils by the partner funded Basingstoke Canal Authority. Built in the 1790s the canal, along with many others in the UK, became derelict by the 1960s and was bought by the two county councils to assure its future. The canal was restored to navigable condition with many hours of volunteer effort over a period of 30 years, re-opening in 1991. Surrey and Hampshire County Councils continue to invest in its future by funding a major maintenance and renewal programme – to ensure the historic structures continue to be safe for today's residents. This means there has and will continue to be some unavoidable temporary closures to navigation - generally programmed for the winter months. The whole of the canal from Woodham Junction to King John's Castle at North Warnborough, is now open for public navigation - however the four Surrey lock flights have restricted opening times to help us conserve water (the canal having had a water supply problem since it was built). The proactive management of lock use has meant that the canal now remains open for navigation throughout the year. Lock times, Canal Byelaws, navigation rules and other boating information is available from the Basingstoke Canal Authority at the Mytchett Canal Centre. A regular navigation update is published on their website, and they have a Facebook page and a Twitter feed to keep you up to date with what is going on. The towpath alongside the full length of the canal is available for public use at any reasonable time although it is not a public right of way. In many places it is possible to walk one way and return by train. The canal is a pleasant green oasis even in the heart of town, it is teeming with wildlife and is specially protected for its range of water plants and dragonflies. Throughout the Woodham – Woking - Brookwood section, the towpath forms part of the Woking Cycle network for all weather cycle use. Elsewhere an all-terrain bike will be needed – please be aware that biking is by permission only, please cycle at a moderate pace and give way to other users - remember - pedestrians have priority. For information on boating, boat trips, fishing, family and children's events and the excellent tea room, contact the Canal Centre at Mytchett on 01252 370073. Follow this link for details of the Vision, Action Plan and Technical Report for the Basingstoke Canal.